The Alamo Hueco Mountains are a 15-mile (24 km) long mountain range, located in the southeast of the New Mexico Bootheel region, southeast Hidalgo County, New Mexico, adjacent the border of Chihuahua state, Mexico. The range lies near the southern end of the mountains bordering the extensive north-south Playas Valley; the Little Hatchet and Big Hatchet Mountains are adjacent, and mostly attached north; the mountain range series, ends south into the flatland plains of the Chihuahuan Desert. The much smaller Dog Mountains are adjacent south. While the Continental Divide of the Americas traverses the western perimeter mountains of the Playas Valley, the Continental Divide National Scenic Trail traverses the entire mountain ranges on the east side of the Playas Valley; the Scenic Trail continues south into the Chihuahuan Desert region of northwest Chihuahua state. The range is 15 mi long and only about 8 mi wide. It trends northwest by southeast and abuts the Dog Mountains to the south on the Mexico-United States border. 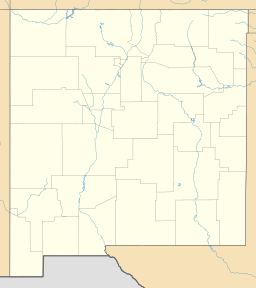 The Alamo Hueco Mountains lie in the southeast corner of New Mexico's 'Bootheel', so the Chihuahua border also lies to the east of the mountain range. The highest peak in the range is Pierce Peak (New Mexico), 6,159 feet (1,877 m), near the range's center-northeast; the peak is located at 31°26′54″N 108°20′06″W﻿ / ﻿31.4484°N 108.3350°W﻿ / 31.4484; -108.3350﻿ (Pierce Peak (New Mexico)). Hat Top Mountain at 5,168 feet (1,575 m) is located on the extreme southeast of the range, and separated from the main northwest-southeast ridgeline. The Continental Divide lies north of the Big Hatchet Mountains and traverses the northern Playas Valley on its water divide. The Continental Divide National Scenic Trail comes through the Big Hatchet's in two trails, at the center and one in the north; also subtrails lead off southeasterly. The main traverse of the Scenic Trail exits from the southwest quarter of the range, to meet the northwest end of the Alamo Hueco Mountains. ^ New Mexico, DeLorme Atlas & Gazetteer, p. 52-53. Wikimedia Commons has media related to Alamo Hueco Mountains.